From fishing from one of our beautiful piers, to floating above the ocean while parasailing, St. Augustine has plenty of outdoor activities to offer visitors and residents alike. St. Augustine fishing is among the best in the world, and you can choose between fishing from a charter boat on the Atlantic or from a kayak in the marsh, throwing a line in from the pier or taking a boat out in the fresh water of the St. Johns River. St. Augustine also offers a variety of golf courses from the championship courses at World Golf Village to a selection of country club courses and public courses, not to mention the world famous Players Club course in nearby Ponte Vedra. Swimming, hiking, biking, horseback riding, diving – you name it, you can find your outdoor adventure here. Take a sunset cruise or rent a boat or kayak and explore the waterways yourself. Please notice the waterway reference provided for you below. See dolphins, a variety of water birds, including gulls, egrets and pelicans, manatees, alligators, horseshoe crabs, stingrays and other wild life from your vessel. Be sure to bring a camera along! There is nothing like being so far out to sea that you can no longer see the shore and feeling a thirty-pound fish tugging on your line. This man versus nature experience will truly remind you why you needed a vacation in the first place. The many fishing charter companies located in St. Augustine, Florida assure you that you don’t need to be an expert to have this experience. If you are, however, already an experienced fisherman, then we don’t need to tell you how ideal St. Augustine fishing is, both inshore in the Intracoastal and offshore. We do want to tell you about the fishing resorts and fishing equipment retailers that are available in the area, so that you can both restock and unwind in a resort that is most sensitive to your needs and wants. North Florida’s year-round temperate weather and cool ocean breezes, make for perfect golf weather all year long. There’s a reason that the World Golf Village, home to the World Golf Hall of Fame and two championship courses, is located in North Florida, just minutes north of St. Augustine’s historic district. Golf is also a popular spectator sport in Northeast Florida. The Player’s Championship has been hosted at Sawgrass in Ponte Vedra Beach, just north of St. Augustine, since 1977. For family vacations, St. Augustine is also home to several mini-golf courses, including Florida’s oldest mini-golf course on the bay front next to the Bridge of Lions. Two more courses on Anastasia Island and one on State Road 16 ensure convenient access to this family classic wherever you’re staying in St. Augustine. Shooting sports and gun shows are very big throughout Florida, including the Historic Coast. The St. Augustine area is home to a number of gun ranges, clubs and organized programs for sport shooting. Check out the Flagler Gun Club if you’d like to try your hand at archery or sport shooting. St. Augustine is rich in waterways, with the Atlantic Ocean, St. Johns River and IntraCoastal Waterway all helping to define the city. Take advantage of the water by learning to scuba dive while you’re here or trying parasailing for a view of the beaches that very few experience. Rent jet skis and zoom along the Intracoastal as an exciting way to spend the afternoon or you can rent a pontoon boat for a family get together that no one will soon forget. With hundreds of trails, forests and beaches to explore, it’s no wonder that Northeast Florida is a popular destination for horseback riding and other equestrian activities. There are a number of stables in the St. Augustine area that rent horses for afternoon rides, training and events. For information on equestrian sports on the Historic Coast, visit one of the links below. Breathtaking helicopter tours are spectacular for special events like the Nights of Lights, but are also just as gorgeous on a clear day when you decide you want to see the amazing stretch of beach between Fort Matanzas, south of St. Augustine, and the Castillo de San Marcos. The clear air of Northeast Florida will always be a welcoming atmosphere for aviators of all experience levels, and there are definitely plenty of sights to see below you both natural and historic. It’s easy to see why motorsports are popular in Northeast Florida. A1A and many other area roads are perfect for early morning or late afternoon rides and many local businesses cater to those who participate in motorsports. St. Augustine is the perfect spot to stay during the famous Daytona Bike Week—close enough that you won’t have to miss many of the events during the weeklong celebration, but far enough away to give you a peaceful place to unwind after a long day. You can also rent a scooter or mini two-seater in town for just a taste of what the Harley owners already know and love. In addition to the rest of our categories, St. Augustine is also a great destination for dozens of other sports and recreational entertainment. 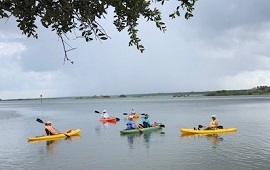 Local state parks — Anastasia, Faver-Dykes, Fort Mose, Gamble Rogers, and Washington Oaks Gardens — as well as Fort Matanzas National Monument (part of the National Park Service), are scenic spots for recreation. Located on the Intracoastal just south of the 206 bridge in Crescent Beach, Genung's is an 'Old Florida' style fish camp. Not only do they have a bait and tackle shop, this 'one stop' spot includes a small marina, kayak and paddle sport rentals, guided kayak fishing charters, and a special event venue perfect for small-sized gatherings.